This is a story of things not going exactly as planned. Viktor and I decided to skip Greymouth so we booked an Intercity Bus to pick us up at the Greymouth rail station after we arrived from our TranzAlpine Train. I saw a guy I spoke with in Rotorua and he said there wasn't much to do in Greymouth anyway. It seems to happen all the time: I always find myself running into people I met towns (A.K.A weeks) ago! We got to our hostel, Sir Cedrics Chateau Franz, just in time for free soup! We met a few different people that night: two people from France, one from the Netherlands, and a few from the USA. That night we went to a couple different bars: The Landing and Monsoon. After Monsoon, Viktor and I decided to check out the glow worms in town. There is a cave you can go to in town as well as a little path. We chose to check out the path because the cave is sometimes flooded. While walking to the path, we saw this eery little church with one door open and a red light lurking inside. We had to check it out. It was one of the creepiest things I've ever seen. This was at 2am and it was absolutely pitch black outside. We slowly walked into the small church. It was empty except for 5 rows of pews and a small alter with a demonic red light on it. We did not stay long enough to explore any more than that. It was slightly terrifying. We walked about 10 minutes down this path, turned the flashlight off and stayed silently still. A few minutes went by and we started to see small glow worms. It wasn't that impressive because there was only about 15. However, it was nice to see them since I wasn't able to visit the glow worm caves in Waitomo in the north island. The next day we got some bad news: the clouds were too low at Franz Josef so all of the Heli Treks were cancelled. We made some friends, booked a heli tour in Fox Glacier, and drove their car 30 minutes south to Fox. When we got there, they told us the two trips that morning made it on the ice so we had a good chance we would, too. We got on our waterproof pants and jacket, socks, boots, and gloves. They gave us our safety run-down and we were about to board the helicopters when one of the managers came out saying the trip was called off because of weather on the glacier. To be honest, I wasn't too upset because 1, I already hiked an amazing glacier in Patagonia (P. Moreno Glacier) and 2, we got a full refund. Instead, we drove down so we could at least see the glacier. To be honest, seeing Fox Glacier from afar wasn't very impressive. It was far away, but not as far away as the view of Franz Josef, and it didn't look very big. What was impressive, though, was the massive valley that the glacier made as it receeded. 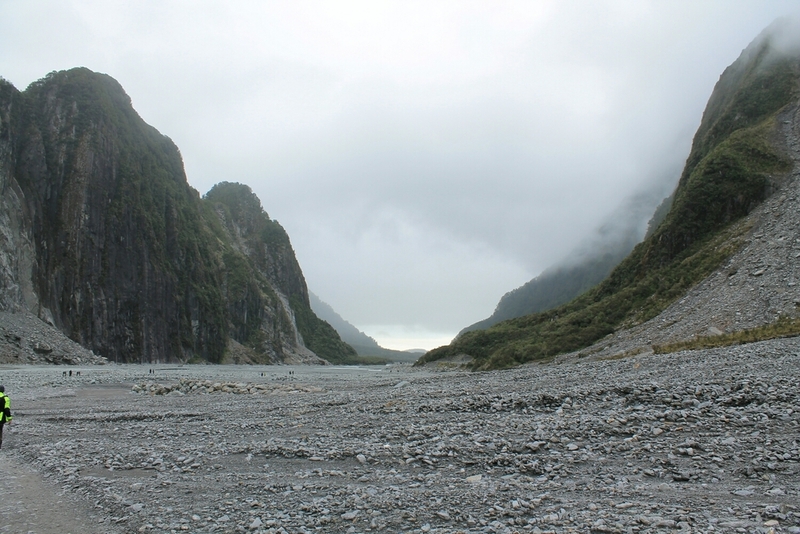 Only a few years ago, the Fox Glacier was able to be entered by foot. Now the only way to get on either glacier is by helicopter. Bob and I standing infront of the glacier. Bob is a 2 dimentional park guide that told us to not go any further because there are rock slides. The huge valley the glacier made from its recession. Long story short, give yourself a few flexible days in Franz Josef and Fox Glaciers because they cancel 60% of their heli trips because of weather. It is certainly a must-do in the south island, though.